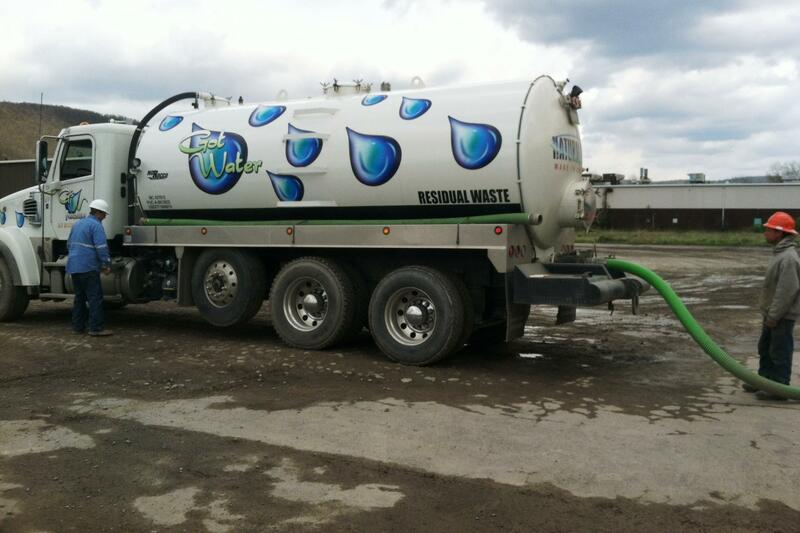 A tanker trucks transports water for hydrofracking operations in Susquehanna County, Pa. Repairs being made to a fracking drill bit in Pennsylvania's Susquehanna County. Transporting the millions of gallons of water, as well as equipment, sand, and other materials needed to hydraulically fracture a natural gas well requires quite a few truck trips, to put it mildly. One well site could require up to 3,399 one-way truck trips [PDF], according to the New York Department of Environmental Conservation's 2011 draft environmental impact statement (dSGEIS) on hydrofracking. All those trips by heavy trucks can quickly beat up and wear out roads if they're not built to handle it. Roadways like the New York State Thruway were obviously designed to withstand heavy traffic. But many of the more rural roads in the Southern Tier, where much of the fracking activity is likely to happen are not, according to David Orr a senior engineer at the Cornell Local Roads Program. "You’ve bent paper clips back and forth because you were sitting on hold, right?" he says. "As you bend them, they eventually break. They’re not breaking from a single application, they’re breaking from the fact you bend them back and forth and back and forth. And that’s how pavements fail." Public works and highway departments in the Southern Tier are aware of the kind of damage that big of an increase in traffic can cause. Because New York has been reviewing whether to allow fracking for four years, many Southern Tier towns and counties have had time to prepare. "If we do not protect ourselves and just let them go, those roads will just bust all up," says Vince Spagnoletti, Public Works Commissioner for Steuben County. "They’ll be in bad shape." Some county roads in Steuben County will not be able to handle the increased weight and frequency of the truck traffic from fracking, according to Spagnoletti. "We do have many miles of roads that do have thick gravel bases underneath them and those roads will not be able handle the traffic, the heavy weights, that the gas drillers will put on them," he says. That's why the public works department has written a road use agreement. Steuben County wrote the first agreement about four years ago when there was prospect of large scale wind development in the region, Spagnoletti says, but it's since been tailored to the gas industry. While rewriting the agreement he took a few trips south to Pennsylvania, which moved forward with exploration of its share of the Marcellus Shale several years ago. Many drilling companies are upgrading roads there to stronger levels than they were at before, Spagnoletti found. They can either float a $250,000 bond that will be used if the roads traveled to a drill site deteriorate. Or they can pay to upgrade the roads first and float a $15,000 bond that will used for any maintenance. Steuben County's road use agreement is voluntary, but Spagnoletti says he's confident drillers will come to the table. If not, he says he's not afraid to close a road he thinks drillers are beating up. Many towns have adopted road use agreements for road under their jurisdiction, or are drafting them, according to Spagnoletti. A few counties over, Tompkins County decided to go a step further in its preparations. There, a road preservation law went into affect January 1. A driller - or any other large construction projects - will have to pay for a structural study of the roads it wants to use before beginning the project. It will then have to float a bond and pay for another study after the work is done. Any repair work will be paid for out of the bond. It will be hard to predict just which roads will need the most work, says Tompkins County Highway Director Jeffrey Smith. "Our level of service on a road varies within the county, within every town," he says. "We have some roads that are comparable to state roads, that really wouldn’t necessarily show damage and then we have some roads that are on the other end of the spectrum that we’d be really concerned about." Just what time of the year drilling begins can make a big difference too. Roads are much stronger in August after a dry, hot summer than other time of the year. "We think that the real danger here is if they start over our roads in spring, during the spring thaw and that we’ll have to keep a close watch on," says Spagnoletti. "if it comes to it, we’ll post the road to keep them off." He says he'll be keeping an extra close eye on any projects that start up in early spring. The state Department of Transportation (DOT) did not respond to interview requests for this story. But a DOT document leaked last summer and shared by an anti-fracking group puts the potential cost of road maintenance due to fracking at $200 to $400 million, annually. DOT officials at the time said the estimates were based on a 2009 dSGEIS and dismissed the document as outdated. 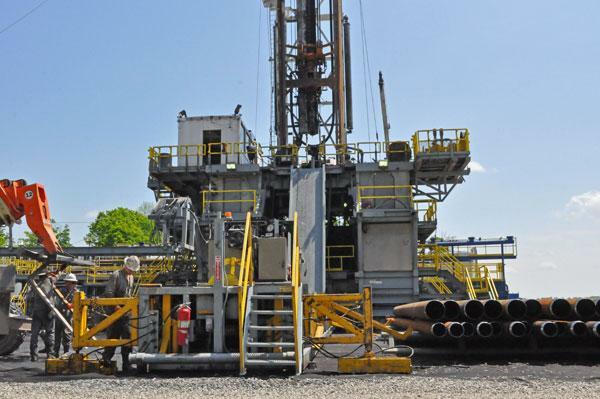 New York State is poised to issue its final plans for regulating hydrofracking. But even with a decision imminent, there’s no guarantee this controversy will die down. Instead, the fight will likely head to the courts. New York State’s Department of Environmental Conservation (DEC) has spent four years studying fracking, and the agency’s final guidelines are expected soon— potentially paving the way to allow drilling. And when that document is made public, environmental lawyers promise to be ready.